Row 1: Dr. Juan-Carlos Baltazar; Dr. Rumya Putcha; Dr. Carly Blustein Gilson; Dr. Patrick Shamberger; Dr. Annie Newell-Fugate; Dr. Anne Shiu Row 2: Mrs. Vicki Montague; Dr. Matthew Ege; Dr. Chris Nowotarski; Dr. Kathrin Anson Dunlap; Mr. Jim Montague. 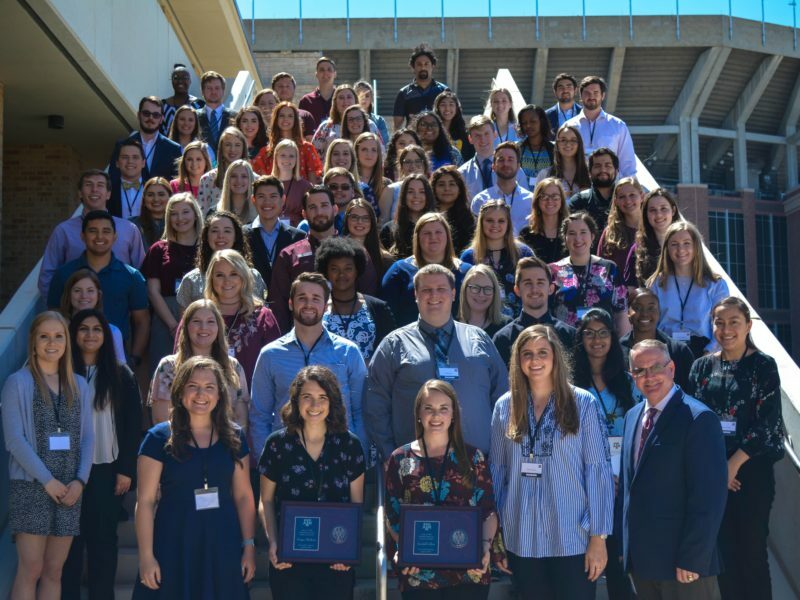 The Center for Teaching Excellence (CTE) has announced this year’s Montague-CTE Scholars, and nine Texas A&M University faculty members were honored Monday, Nov. 5 for their commitment to and potential for excellence in teaching. Texas A&M University President Michael K. Young, in his welcome address, shared that the true impact and legacy of each faculty member is realized through the success and accomplishments of their students. The Montague-CTE Scholar award is named in honor of Kenneth Montague ’37, a distinguished alumnus and outstanding trustee of Texas A&M University Development Foundation, who had a long and storied career in the Texas oil industry. Ken and Judy Montague endowed a generous gift in 1991 to benefit the future “Ken Montagues,” Aggies who are life-long learners and contributors to their communities. The Center is deeply grateful to his son, Jim, and wife, Vicki, for their generous and continued support that recognizes excellence in teaching and learning at Texas A&M University. The award is given annually to one tenure-track assistant professor from each College, based on their early success in and passion for teaching undergraduate students. Awardees receive a $6,500 grant to encourage further development of teaching excellence. This award has been granted to more than 260 faculty. For more information on the Montague-CTE Scholars program, please visit the Center’s website at CTE.TAMU.EDU or contact smacwillie@tamu.edu. Media Contact: Sherri MacWillie, 979-862-1655, smacwillie@tamu.edu.